Preview of Egypt vs Uruguay predictions and betting tips for their kick-off on June 15 at the 2018 FIFA World Cup in Russian Federation is here. There would be an interesting fixture on Friday, but who will prevail earning valuable points in the Group A? This is officially Match 2 on the 2018 World Cup. A Northern Africa's outfit Egypt to host South American Uruguay side on papers, because actually, they play in Russia, of course. This exciting tie is going to be held at the Central Stadium in Yekaterinburg. Having the English Premier League 2017/18 Player of The Year Mohamed Salah on board, Egypt are as strong as never on the international level. But will the main Egyptian star be fit and ready after a recent injury? Read expert predictions and betting tips down the page. Egypt are still an underdog at bookies' odds. A Pharaohs' win is priced by bookmakers at up to 7.90. A draw can be taken at 3.90, while an Uruguay's success is at 1.60. The Uruguayans certainly possess more individual class that Egypt have on their side, but will it be enough for a positive start in the 2018 FIFA World Cup Group A? As to correct score odds, Uruguay to win 1:0 is the most likely outcome at 5+. A favorite's 2:0 victory is estimated slightly less probable, at 6.50. A draw to finish 0:0 is 8.00, or 1:1 is 7.50 - not a big difference. At least, if you believe in the Hector Cuper's boys, you are welcome to bet on the Egypt 1:0 triumph at 13, or a 2:1 narrow victory at 27, the further the higher. This should be closer than the odds suggest. If we could get only one advice as the main World Cup betting tips, we'd say: Never ever back a favorite against a tough opposition at so short price like Uruguay @1.60! Egypt are not Salah only, they also have some decent players, more than that, they have had a great team play so far. Looking for proper Egypt vs Uruguay predictions at the World Cup, the initial bet we are predicting is under 2.5 goals. This means that if both teams will score none, or one, or two goals altogether, our bet is a winning one. The odds for it are not higher than 1.60, but it is reliable enough. The first match in Group stage is when both sides are primarily tend not to lose still seeking their best play. And the Arabs are very tough nut to crack at their back. If you demand a correct score bet in this World Cup Group A fixture, let it be a 1:1 draw. Still, Salah (if available), Cavani and Suarez are not the company that makes scoreless results so appealing. The Uruguayans have more options in attack, for sure, however, they are prone to conceding goals. Egypt will be more satisfied with a draw that means they won't open up if they won't be losing, as to be predicted. Recall the odds for a 1:1 score are 7.50. 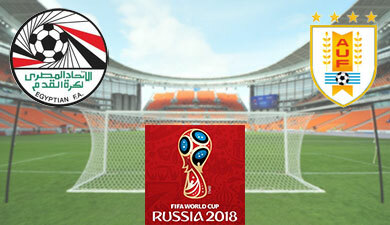 And let it be our next of Egypt vs Uruguay predictions for their opening 2018 World Cup affair. Betting on Egypt vs Uruguay should be based on underdog's options with a low-scoring game considering, in our opinion. This is a common idea for the World Cup fixtures between similar sides.